Our November issue features a road test by Alan Cathcart of the all-new Ducati Monster 821. 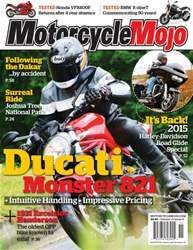 This high-tech middleweight is the most advanced Monster to date. We also bring you a riding test of the BMW R nineT, a back-to-basics machine that oozes personality. Two new models are reintroduced to the delight of many riders – we report on the return of the Honda VFR800F, and the 2015 Harley-Davidson Road Glide with new Rushmore accouterments. Our travel features include the Joshua Tree National Park in California and riding in the Canadian Rockies on a six-day tour on some of Canada’s best riding roads. Our adventure piece comes from an Englishman riding in South America who inadvertently infiltrates the Dakar Rally. All this plus much more.